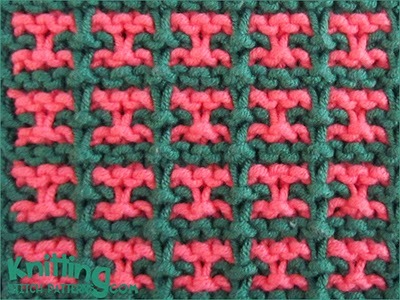 With color A, cast on a multiple of 4 sts, +1 and knit one row. Row 1 (Right side): With color B, * sl 1 wyib, k3; repeat from * to last st, sl 1 wyib. Row 2: With color B, * sl 1 wyif, k3; repeat from * to last st, sl 1 wyif. Row 3: With color A, k2, * sl 1 wyib, k3; repeat from * last 3 sts, sl 1 wyib, k2. Row 4: With color A, k2, * sl 1 wyif, k3; repeat from * to last 3 sts, sl 1 wyif, k2. Row 5: With color B, as row 1..
Row 6: With color B, as row 2. Row 7: With color A, knit all sts. Row 8: With color A, knit all sts. Repeat rows 1- 8 till necessary for completing your project. With yarn in front; wyif | With yarn in back: Wyib.